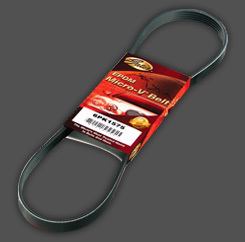 Gates Micro-V® Stretch Fit™ Belts, with exclusive self-tensioning technology, are the first and only aftermarket belts engineered to fit and perform properly on these unique Stretch Fit™ drive systems. On the surface, Stretch Fit™ belts may look like standard v-ribbed belts, but inside they are dramatically different. The secret is in Gates' new Twistlock™ technology where the strength and flexibility of advanced polyamide tensile cord is surrounded by a specially formulated adhesive that literally locks on to the cord, allowing the cord to elongate and stretch but never lose tension. Note: The Micro-V® Stretch Fit™ belt is not interchangeable with the standard Micro-V® belts in the market where tensioning is required. Please ensure you get the correct part number for the correct application model. 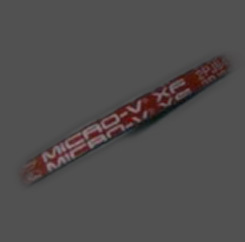 The belt will not perform if a standard Micro-V® belt is used on the Micro-V® Stretch Fit™ application. 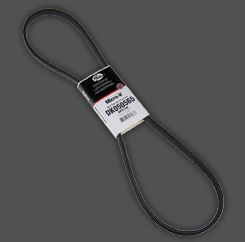 Gates Micro-V® Stretch Fit™ Belts, with exclusive self-tensioning technology, are the first and only aftermarket belts engineered to fit and perform properly on these unique Stretch Fit™ drive systems. On the surface, Stretch Fit™ belts may look like standard v-ribbed belts, but inside they are dramatically different. The secret is in Gates' new Twistlock™ technology where the strength and flexibility of advanced polyamide tensile cord is surrounded by a specially formulated adhesive that literally locks on to the cord, allowing the cord to elongate and stretch but never lose tension. Note: The Micro-V® Stretch Fit™ belt is not interchangeable with the standard Micro-V® belts in the market where tensioning is required. Please ensure you get the correct part number for the correct application model. 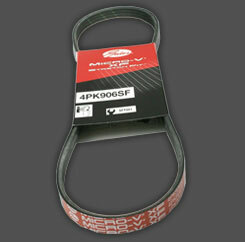 The belt will not perform if a standard Micro-V® belt is used on the Micro-V® Stretch Fit™ application. Gates Micro-V® Stretch Fit™ Belts, with exclusive self-tensioning technology, are the first and only aftermarket belts engineered to fit and perform properly on these unique Stretch Fit™ drive systems. On the surface, Stretch Fit™ belts may look like standard v-ribbed belts, but inside they are dramatically different. The secret is in Gates' new Twistlock™ technology where the strength and flexibility of advanced polyamide tensile cord is surrounded by a specially formulated adhesive that literally locks on to the cord, allowing the cord to elongate and stretch but never lose tension. Note: The Micro-V® Stretch Fit™ belt is not interchangeable with the standard Micro-V® belts in the market where tensioning is required. Please ensure you get the correct part number for the correct application model. 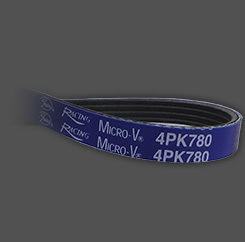 The belt will not perform if a standard Micro-V® belt is used on the Micro-V® Stretch Fit™ application.